Many Beltane blessing to those of us in the Southern Hemisphere, although it is Spring here it is a cold drizzly day here on the mountain. The Rhododendrons are blooming and everything looks beautiful. Blessed Be! Many Samhain blessings to those in the Northern Hemisphere as you head towards the cold winter months, keep warm and cosy and today have a happy Halloween. Blessed Be! Beltane Blessings to those of us in the Southern Hemisphere, although we are in Spring it is a cold wet day here, and we’re keeping warm and toasty in front of the fire with a cat curled up beside me. Blessed Be! Samhain blessings to all in the Northern Hemisphere, and happy Halloween. Blessed Be! For many modern Pagans, there has been a resurgence of interest in our family histories. We want to know where we came from and whose blood runs through our veins. Although ancestor worship has traditionally been found more in Africa and Asia, many Pagans with European heritage are beginning to feel the call of their ancestry. This rite can be performed either by itself, or on the third night of Samhain, following the End of Harvest celebration and the Honoring of the Animals. First, decorate your altar table — you may have already gotten it set up during the End of Harvest rite or for the Ritual for Animals. Decorate your altar with family photos and heirlooms. If you have a family tree chart, place that on there as well. Add postcards, flags, and other symbols of the country your ancestors came from. If you’re lucky enough to live near where your family members are buried, make a grave rubbing and add that as well. In this case, a cluttered altar is perfectly acceptable — after all, each of us is a blend of many different people and cultures. Have a meal standing by to eat with the ritual. Include lots of dark bread, apples, fall vegetables, and a jug of cider or wine. Set your dinner table, with a place for each family member, and one extra plate for the ancestors. You may want to bake some Soul Cakes. If your family has household guardians, include statues or masks of them on your altar. Finally, if a relative has died this year, place a candle for them on the altar. Light candles for other relatives, and as you do so, say the person’s name aloud. It’s a good idea to use tealights for this, particularly if you have a lot of relatives to honor. The oldest family member then serves everyone else a helping of whatever dishes have been prepared, except for the wine or cider. A serving of each food goes on the ancestors’ plate before the other family members recieve it. During the meal, share stories of ancestors who are no longer among the living — this is the time to remember Grandpa’s war stories he told you as a child, tell about when Aunt Millie used salt instead of sugar in the cake, or reminisce about summers spent at the family homestead in the mountains. and so forth. Feel free to add in place names if you like, but be sure to include at least one generation that is deceased. For younger family members, you may wish to have them only recite back to their grandparents, just because otherwise they can get confused. Go back as many generations as you can, or (in the case of people who have done a lot of genealogy research) as many as you can remember. You may be able to trace your family back to William the Conqueror, but that doesn’t mean you have it memorized. After each person recites their ancestry, they drink from the cider cup and pass it to the next person. A quick note here — many people are adopted. If you are one them, you are fortunate enough to be able to choose whether you wish to honor your adoptive family, your biological family, or a combination of the two. If you don’t know the names of your birth parents or their ancestry, there’s nothing wrong with saying, “Daughter of a family unknown.” It’s entirely up to you. The spirits of your ancestors know who you are, even if you don’t know them yet. If you didn’t do a separate ritual for animals, you can add photos and candles for deceased pets to your family altar. If you like, you may wish to follow this ritual with a Seance. If your children are younger, and you’d like to include them in a short ritual, consider holding an Ancestor Ritual for Families With Children instead. Blessed Beltane to all in the Southern Hemisphere. 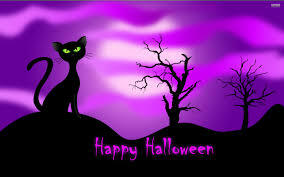 To all in the Northern Hemisphere I wish you a blessed Samhain and enjoy Halloween. “Sam” and “hain” meant “end of” and “summer” to the Celts. They observed only two seasons of the year: summer and winter. So, Samhain was celebrated at the transition of these seasons. Samhain, (pronounced SOW-in, SAH-vin, or SAM-hayne)is the third and final Harvest. The dark winter half of the year commences on this Sabbat. It is generally celebrated on October 31st, but some traditions prefer November 1st. It is one of the two “spirit-nights” each year, the other being Beltane. Originally the “Feast of the Dead” was celebrated in Celtic countries by leaving food offerings on altars and doorsteps for the “wandering dead”. To Witches, Samhain is one of the four High Holidays, or Greater Sabbats. Because it is the most important holiday of the year, it is sometimes called ‘THE’ Great Sabbat. Pagans consider Samhain the most magical night of the year. It occurs exactly opposite of Beltane on the Wheel of the Year. It is a night of glowing jack-o-lanterns, tricks or treats, and dressing in costume. A night for telling chilling ghost stories by the fire. And a time for seances, tarot card readings and scrying with mirrors. It is upon this night, that the veil which seperates our world from the Otherworld is at its thinnest, making it a Night of Power. As Witches,we observe this day as a religious festival. We consider it a memorial day for dead friends and family. It is still a night to practice various forms of divinitory arts such as scrying and rune casting. One could never hope for a better Tarot reading than on this night! Samhain is considered a time to wrap up old projects, take a good look at one’s stock in life, and consider new projects and endeavors for the coming year. Bonfire, hearth fire, candle – gaze into the flame and revisit our ancient heritage. Draw friends close and leave an offering for the whispering ghosts. Samhain is here. Let the Samhain BONFIRE burn high & bright ! Happy New Year 2007! Altar should be decorated with Pumpkins, Wheat, colorful Native American Corn, Gourds. Fall leaves you have gatherd while walking in the woods or parks. Pine cones & Acorns. Pictures of dead ancestors (relatives or pets), Rosemary herb plants or dried bundles, Black and Orange candles. Scrying mirrors and or divination tools such as Tarot cards & Rune Stones. Allspice Berries, Broom, Catnip, Mountain Ash Berries, Mugwort, Mullein, Oak leaves, Acorns, Rosemary, Sage, Pine cones, Straw. In the Southern Hemisphere I wish you a blessed Samhain, as the weather turns cold it is time to light the fires and snuggle up, be warm and honour the season as it changes. Blessed Be! The Pagan year begins (and ends) with Samhain. It is a time of reflection, of looking back over the last year. This is the time when the boundary is thinnest between the worlds of living and dead; the powers of divination, the Sight, and supernatural communication are strengthened on Samhain night, and it is considered a powerful but dangerous time to communicate with lost loved ones. Pagans celebrate Samhain as an acknowledgment that without death, there can be no rebirth. At Samhain, the darkness increases and the Goddess reigns in her powerful aspect of the Crone. The God passes into the underworld to become reborn of the Goddess again at Yule. It is a time to honour those who have gone before us. And to everyone in the Northern Hemisphere, rejoice as the sun begins to shine and the flowers begin to bloom. Let your hearts burst with joy as the light shines down upon you. Blessed Be! 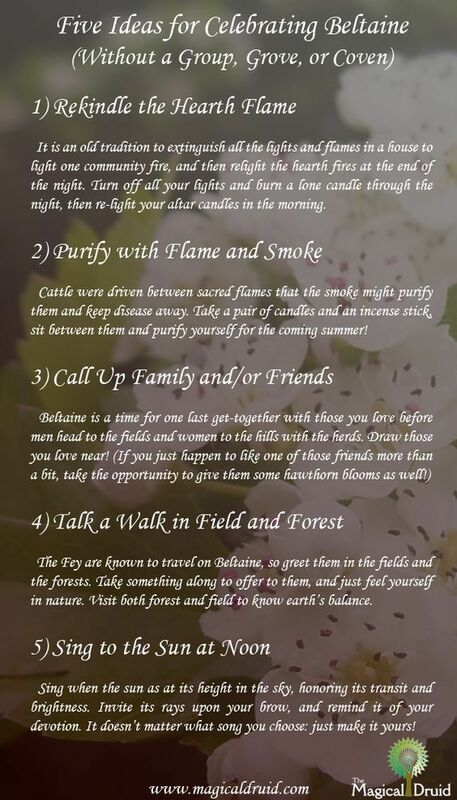 Beltane is the cross-quarter holiday between Spring Equinox and Summer Solstice. 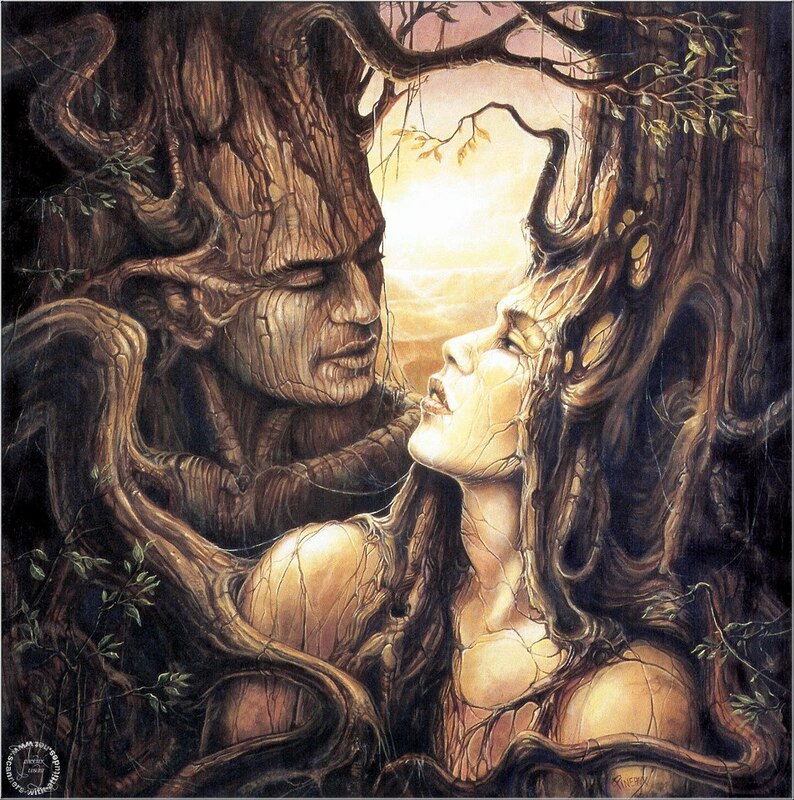 It is the time when the abundance of flowers and greens is a welcome relief from winter’s drabness; it was traditionally a day for leaping the Beltane fires, which were lit to honor the Sun God, and for celebrating fertility. 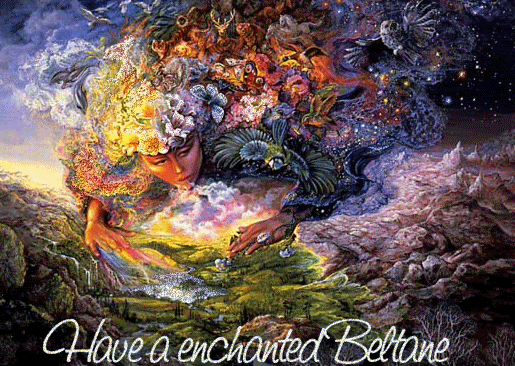 Beltane celebrates the blessing between Mother Earth and Father Sky and honors all life. I wish to all in the Southern Hemisphere a blessed Beltane. We here in the Southern Hemisphere do Halloween even though in reality for us it is April. You can’t really tell children they ought not be celebrating Halloween when everyone else does. Therefore children go trick or treating here as well. Also known as Bealtaine, Walpurgisnacht, May Day, (Northern Hemisphere) & Novey Eve (in Southern Hemisphere). 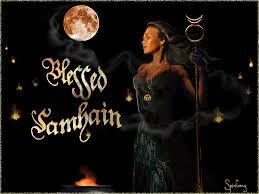 And for those in the Northern Hemisphere Samhain blessings are sent your way. Samhain (SOW-en) is the one Sabbat that is also widely celebrated amongst non-Pagans. The God has died, and the Goddess mourns him until his rebirth at Yule. It’s the last harvest festival, and the end of the Wiccan year.